Would you like to check a whole list of VAT numbers, or perform manual VAT number checks unlimitedly? Then you should create an account. Do you like to know what costs are before you create an account? Click here for our rates. - You can register easily and quickly. Fill in your details on the application form and click on Next. - Select the number of credits you want to buy, using the arrow. You see immediately what your purchase will cost. Click on Next. - Fill in your billing information. After that, you have to click on Next. - You will now get an overview of the data you entered. To place your order, you need to agree to the General Terms and Conditions. To finalize your order, you have to click on Next. - In the next screen you choose your payment method. You can choose between PayPal, iDEAL, giropay, DIRECT ebanking.com, Bankcontact/Mister Cash, Visa, Mastercard and Maestro. - Choose a method of payment and fill in your details. When you have completed the payment, the purchased credits will be credited directly to your account. 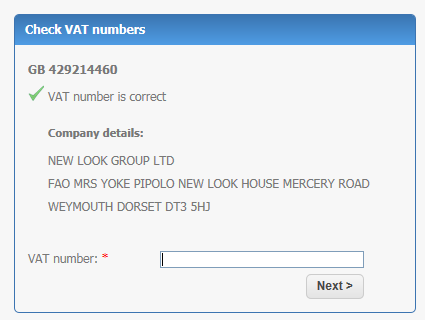 If you have an account on VAT-check.eu, you can perform manual VAT number checks. You pay one credit per verified VAT number. - Go to www.VAT-check.eu. You click on Log in and you log in with your username and password. - If you are logged in, you will get a new menu on the right. You can use this menu to return to the control window and you can view and change your personal information. - In the main window you will see two control windows. One window for manual checks (above) and one window for bulk checks (below). - If you would like to check one single VAT number, you enter this VAT number in the upper fill-in window and click on Check. - After verification the results will be shown immediately. If there are company data available, they will also be shown. - You can immediately enter and check the next VAT number in the control field. In order to verify a whole list of VAT numbers in one go you need tot log in tpo your account. You pay one credit per verified VAT number. 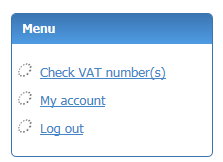 - Go to www.VAT-check.eu and log in to your account via the log-in screen on the homepage. - In the main window you use the lower control window where you can check a file with VAT numbers. You can also view VAT numbers and results verified before. You will find these under View history. - Click on Browse and select the file containing the VAT numbers to be verified. Then click on Next. - You will now get an overview of the imported file. Link the right column to the feature concerned. To verify the validity of the whole list, you click on Check. - You will then get a wait screen. The system now makes a connection to the VAT systems of the various EU countries. - After verification you will get an overview with the results of the verification. Please note: there are several tabs in the overview of the results. - You can export the overview of the results and file it on your computer as a CSV file or an Excel file. If you have any questions after reading the instructions, you can always contact us. We will be happy to answer your questions.